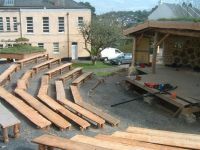 The Kinsale Playhouse – Kinsale FEC: one of my favourite projects…you’ll find a pdf. version of this here. 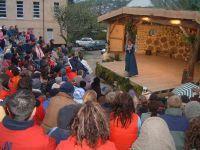 The main framework for the stage was then put into place, using local larch from a nearby sawmill. The ‘backbone’ was of 9′ by 3’s, with 6′ by 2’s over that, and then with 6′ by 1′ boards forming the decking. Once this was in place, we began to mix cob, which secured the boards in place. Helped by roundwood pole builder Saul Mosbacher, we carried on building the walls through April and May, and by the time of the summer holidays, the walls were about half way up. 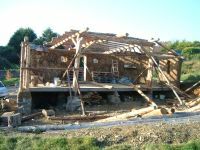 One of the problems with running a permaculture course during college term time, is that at the time of year when everything is growing and the weather is dry for building, everyone is on holiday. Traditional cob builders always say that you should only build with cob “from when the swallows come to when the swallows leave again”. This is because the deeper you get into winter, the slower and slower the cob dries. 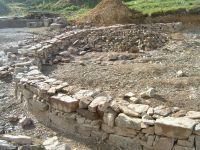 When the new intake of students resumed work on the amphitheatre in September, the drying had already begun to slow. We were also aware that winter was fast approaching, and that there was a considerable urgency to get the roof on as soon as possible. 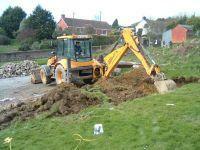 We therefore focused on getting the walls up, and over 3 weeks we got the walls up to wall plate level. Unfortunately, one freestanding section of cob wall didn’t really like being built so fast, with wet cob on top of wet cob on top of wet cob, and it began to lurch sideways quite precariously. 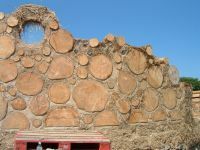 We decided that we would push it over and frame it instead, and make wattle and daub infill panels. It actually ended up looking really good, and the students got to add another technique to their natural building tool kit. Lifting the henge into place was quite an undertaking. We tried it once with all the first year permaculture students, around 30 of us, and we couldn’t do it. We went and gathered the second year permies as well, and with the combined muscle power of about 45 of us, we heaved the frame up into place. Once that was up, we started to add the other poles, and gradually the roof took shape. 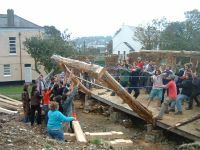 Once all the beams were fixed, we began to board over the top, using 6′ by 1′ boards, many of which were reclaimed from a nearby glass factory, being the crates that the glass was imported in. The factory were delighted that someone would take them away and that they wouldn’t have to burn them all (as they had been doing up to that point). The students ripped them down into individual boards and these were nailed up on the roof.